A linear network which contains two or more independent sources can be analyzed to obtain the various voltages and branch currents by allowing the sources to act one at a time, then superposing the results. 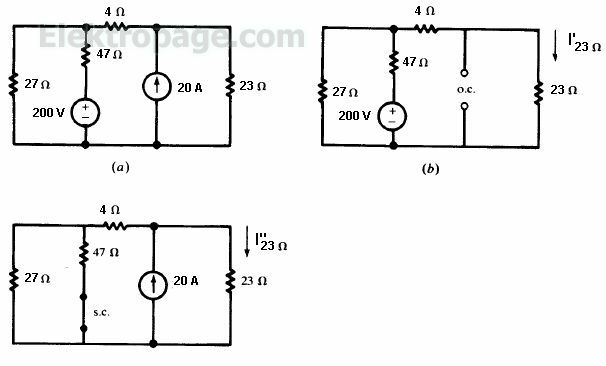 This principle applies because of the linear relationship between current and voltage. With dependent sources, superposition can be used only when the control functions are external to the network containing the sources, so that the controls are unchanged as the sources act one at a time. 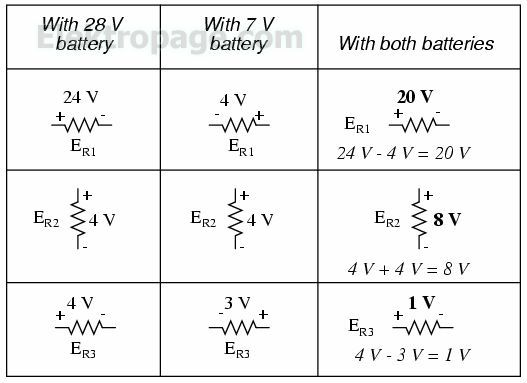 Voltage sources to be suppressed while a single source acts are replaced by short circuits; current sources are replaced by open circuits. Superposition cannot be directly applied to the computation of power, because power in an element is proportional to the square of the current or the square of the voltage, which is nonlinear. Which contains the superposition principle implicitly. Note that the three terms on the right are added to result in current I1. If there are sources in each of the three meshes, then each term contributes to the current I1. Additionally, if only mesh 3 contains a source, V1 and V2 will be zero and I1 is fully determined by the third term. Compute the current in the 23- resistor of Fig. 4-11(a) by applying the superposition principle. With the 200-V source acting alone, the 20-A current source is replaced by an open circuit, Fig.